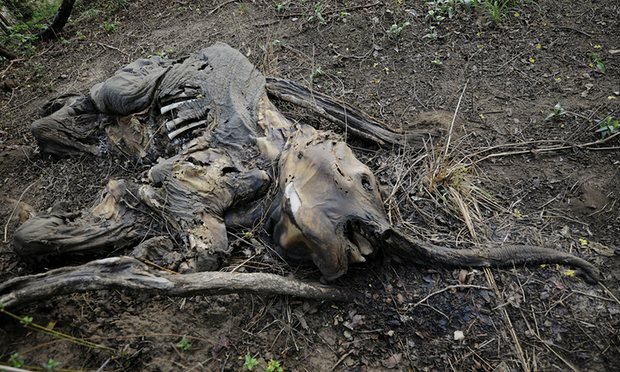 By 2020 two thirds of all wild animals who once lived in the world will be dead. In just two years’ time, the World will have lost two-thirds of all wild animals. This amazing statistic from The Living Planet Index goes on: The number of wild animals living on Earth is set to fall by two-thirds by 2020, according to a new report, part of a mass extinction that is destroying the natural world upon which humanity depends and at the current rate all species would be totally gone before 2050. Below is a snippet of the carnage around the world in just the last few days. 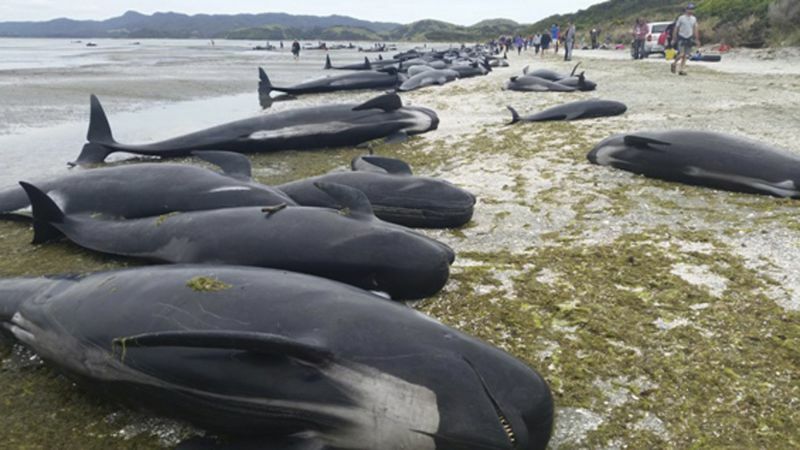 SAPO24 reported, more than two dozen pilot whales died after they hit the coast on two beaches on the Cape Verdean island of Maio, in an environmental disaster that is all too common around the world recently. A biologist explained that the foundation received the alert at the end of the day, having moved teams to the place, where they found the whales already dead. Photo SAPO24. More than 20 pilot whales die as they hit the coast of the Cape Verdean island of Maio. Yahoo7 reported Wednesday of mysterious deaths of pelicans, turtles and fish creates with a reporter claiming it was difficult to see the water from dead foul smelling fish. The dead and dying creatures have been found around Bushells Lagoon, near Wilberforce northwest of Sydney in Australia. Most put it down to a combination of unusually high water temperatures, and pollution. 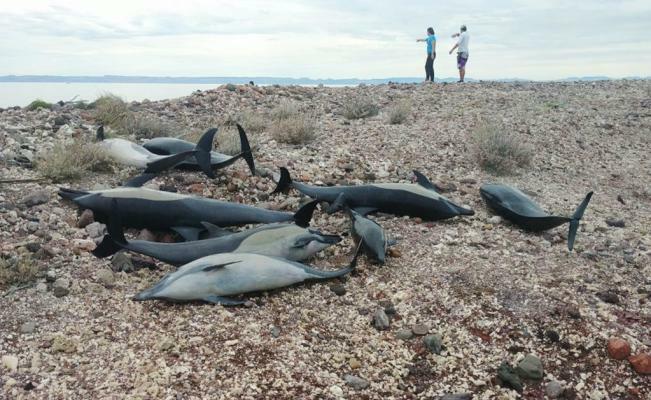 54 dolphins were found stranded in the Bay Of Lapaz, Baja, California Sur Tuesday according to El Universal. Experts and helpers tried in vain to save the dolphins but 24 died. 11 dolphins have been found dead along the coast of Mazatlan, Mexico. As usual in these circumstances, officials are left puzzled as to why the dolphins are dying and are busy trying to find a reason for the deaths. Last week Tempco.com reported, 160-tons of tilapia fish were scattered in and around Maninjau Lake in Indonesia. The reason for the deaths is unknown but some local experts believe the water was poisoned by sulfur from a nearby volcano. 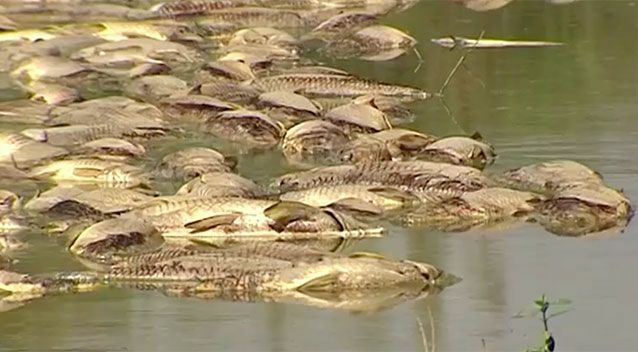 According to another expert, these fish died due to high winds which hit the area resulting in the fish rising to the surface of the Lake, which depleted the oxygen. Infocielo reported Wednesday, Mystery and controversy: What happened to the fish in Laguna de Lobos Buenos Aire Argentina? 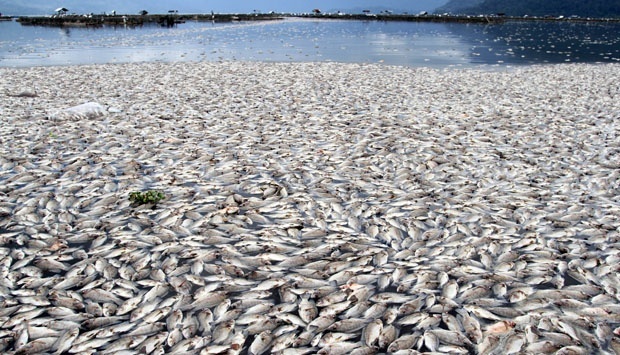 The lack of rain throughout the province of Buenos Aires, plus the high summer temperatures have caused a shocking amount of fish to die along the banks of the lagoon. 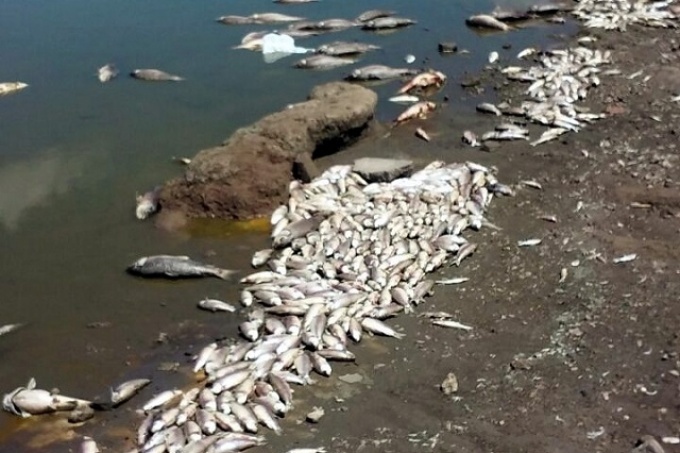 Also in Argentina, thousands of fish were found dead on the Florentino Canal Cordoba, about 10 kilometres south of the town of El Fortin in Cordoba, in the department of San Justo. The striking images with the fish floating on the water were seen on Thursday morning and according to specialists is a phenomenon called eutrophication, caused by three natural factors such as high temperatures, lack of oxygenation in water and low current. Last month's unseasonably cold temperatures caused the deaths of 35 manatees across Florida, five times as many as last January, according to the Fish and Wildlife Conservation Commission. 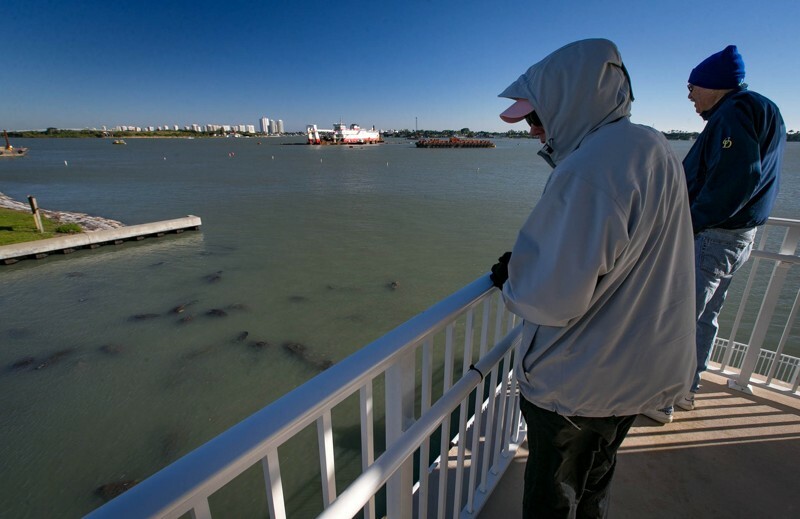 Total manatee deaths, including those killed by boats, was 87, more than double last January. after this it's our turn to go extinct. Maybe we humans should be kind enough to go extinct before taking everything/body with us, but we'd have to hurry up with it. I am ashamed to be a member of the 'developed' population of our species. Korea uses tidal generators on bouys to heat rivers ports during winter freezes. These self generating bouys also have cooling mode. Temp range can be set. We need to add these to lakes lagoons ocean areas were extreme temp is an issue. They can also add areators to add oxygen to the water. This tears my heart to pieces! How can humanity be so irresponsible with our planet and our resources as well as our animals? They know what is killing our Marine Life, so why are they lying? It's all that illegal and so-called legal dumping of chemicals, garbage, oil, and pharmaceutical drugs! There is Nothing MORE Sick and Derange than a greedy hungry soulless businessman! They don't care who or what they destroy to become RICH, CONSEQUENCES BE DAMNED! And the results of our Beloved Planet Earth and her CREATURES shows it! One day their blood money won't save them because we won't have fresh water to drink or fresh meat to eat. Does anybody really think the masses give a heck? It is far to late to do anything. By even suggesting there is a answer to this problem, shows the ignorance of even the believers, they dumbed down, with very little knowlage as to the exctintion event well started. Feed backs have started ramping up their input and will soon take over. Look up and see your doom. PRIME SOURCE, the creator of all in the universe, knows exactly who all of these criminals are. But, since we live in a free-will universe, SOURCE must first receive humanity’s plea to rid planet earth of these totally evil, satanic and pyschopathic creatures. Let’s "git-er-done!!!" Most people are clueless about what chem-trails are, much less that they actually exist. That’s because most current-day humans aren’t very good at observing everything that’s around, under and above them. When I mention chem-trails to people I know, it’s like Huh!!! Are you nuts??? Even when I point out the long stringy, criss-crossing “clouds” in the sky (that is an almost daily occurrence over central PA and elsewhere around the world) and explain that this IS NOT NORMAL, most just consider it useless information coming from a “conspiracy theorist.” It just seems beyond their comprehension that they are literally being poisoned from above. If you or I were to scatter poison over our neighbors property we would be arrested and put in jail in a heartbeat. But, there is a different set of rules for the criminals in power. Please Note: Early today, 2/17/18, heavy chem-trail spraying was already going on at 6:30 over my house. Otherwise the skies would have been clear. By 9 am the skies were nearly overcast with chem-trail activity visible through breaks in the cloud cover. There are hundreds of dead trees on the property behind my house from years and years of heavy chem-trail spraying, along with Fukushima radiation fallout. The only way to put an end to the madness is if enough enlightened souls send a personal message to PRIME SOURCE to assist in ridding planet earth of these satanic criminals. Everyone reading this should do it, TODAY!! Let's "git-er) done!!!" arent tilapia some gmo fish raised in farm ponds? I daresay the survivors (human and animals) of the next mass extinction will have no use for whining, self-loathing nihilists, when they start over. Don't take yourself too seriously, and yes we are contributing to the problem. Cosmically induced extinction events happen every few hundred years independent of humans. The earth changes before the black death killed about 70% of humans in Eurasia. 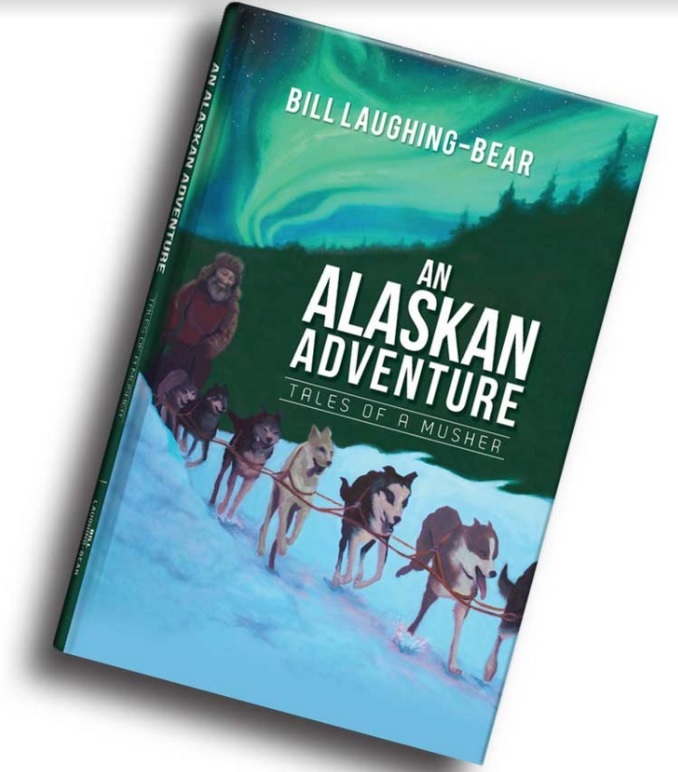 (see my E-book). We even survived the Younger Dryas Boundary event 12,900, that made 75% of all large mammals in the Americas and Europe extinct.